It’s time to look at a pretty recent anime that came out. I hadn’t seen any boxing titles prior to checking this one out so that was definitely pretty cool. It’s definitely a quality title that does a good job of illustrating the kind of world Joe is in. It doesn’t lose sight of the main plot during this though so it consistently moves at a good speed. Really the only bad thing about the show is the opening and in the grand scheme of things that doesn’t mean a lot. The show takes place in the future. Boxers now use cybernetic enhancements to fight known as “Gear.” It’s like a robotic backpack that extends to your fists. Some have it ingrained in their bodies while others use the basic gear. Joe has been fighting in an underground arena for all his life and he’s sick of it. He has to throw fights to win and as such he is unable to really test his skills. His big chance occurs when they announce the Megalonia tournament. He decides to enter and gets into the tournament with a fake id thanks to some help from his coach Nanbu. Still, the more Joe climbs up the ranks the more it seems like he can’t escape his fast. What will end him first? The top ranked boxer Yuri, or his dark past? Right away you can tell that Megalo Box did a good job with the atmosphere. It’s going for a very realistic setting despite being in the future. For the most part it actually feels like the past, but it just shows the natural progression of how the rich have gotten even richer while the poor continue to fade away. It doesn’t go too far into making the place tough to look at either though. I’m not a big fan of deserts of those kind of backdrops because I like seeing the more high-tech areas. As such the best looking scenes are often in the ring or at Megalonia. Still, the show did a good job with the setting. The soundtrack is also top notch. The themes all capture the moments that they’re placed in. They help up the intensity without feeling really forced or anything like that. It’s probably one of the best soundtracks that I’ve heard in quite some time. The animation is also pretty solid. It’s nothing extremely high end, but it’s all pretty smooth. I don’t recall any bad looking episodes so it was pretty consistent the whole time. It continues to give 12-13 episode titles a good name. They seem to consistently have some of the best animation, pacing, and music available. Something about only being 12 episodes seems to help enormously with the budget which makes sense. I think it creates a cycle where the best writers/animators try to get onto those shows and so they continue to excel. As I mentioned, the show does falter with the opening though. It’s just pretty terrible which is surprising. It’s going for a meta look at Joe at a literal dog and other such stuff, but it doesn’t really give you a good impression of the show. If you showed me the opening I would have told you that the show was likely terrible. There’s just no potential in the opening or anything to grab your attention. The music for the song isn’t particularly catchy either. I definitely don’t agree with the approach the show was going for with this intro. The character cast was solid so lets quickly talk about them. The best character is the reigning champ of Megalonia. His name is Yuri and he’s pretty much the rival/main antagonist all in one package. I like his confidence and he’s the kind of opponent who is fighting for something. He’s not just a random obstacle to face nor is he a boxer who turned crazy. The guy just likes a good fight and is also trying to reward the faith that the leader of the corporation put in him. He’s a good guy and also just wants a clean fight. He won’t accept a win any other way. We don’t get to see him fight much at all (mainly because of the show’s length) but he is definitely a scene stealer. Then you’ve got Joe who was close to taking on Yuri for the top spot here. He’s always looking for a fight and is a very aggressive character. 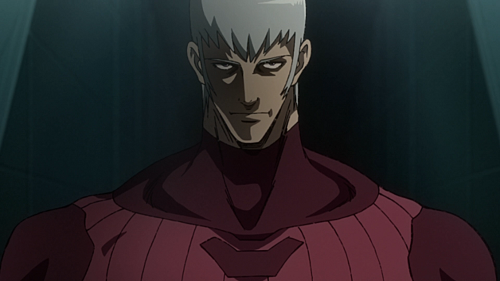 A lot of times the main character can heavily influence how good a show is and I think Joe also contributed to Megalo Box’s quality. When the villains try playing mind games with him Joe is often able to get past this without help. Where other characters would start guilt tripping themselves Joe is able to stand strong. A good example of this is when a guy who lost his legs in a war shows up to guilt trip Joe. Joe doesn’t buy it and after explaining that it has nothing to do with him just goes in for the win. Joe is fixated on getting to the top and doesn’t let anything get in his way. That’s not to say that he doesn’t have any doubts or trials, but he does a good job of getting past them. Then you’ve got his coach Nanbu. That guy isn’t quite as solid as the first two. Mindgames always work on him and the villains tend to have a lot of leverage on him so he’s not someone that you can really count on most of the time. He’s also got the toughest road to follow in the show as bad things seem to happen to him constantly. A lot of it is trouble that he really started though so you can only sympathize with him so much. Long story short, he’s a decent mentor character, but definitely not one of my favorite characters. Then there’s the kid Sachio who isn’t quite as bad as he could have been. He’s still a little out of place among the main members of the cast though. He isn’t nearly as smart or witty as the others so he ends up just being around to throw tantrums when he doesn’t get what is going on. I don’t think he ever really needed to stick around. Yukiko is the rich leader of the company sponsoring the tournament. As such she does serve as one of the main antagonists. Unlike Yuri she is not about fair play and will succeed no matter what the cost is. Still, she is reasonable for the most part. She does share some of the usual prejudice against the lower class but is at least willing to provide a safe haven for the kid. She got a good amount of closure in the ending. Fujimaki is the leader of the thugs and someone who helps the main characters quite a bit. He’s an annoying antagonist who gets in the way a lot, but he is certainly good at his job. I was glad that the random villains couldn’t hack his fake ID so easily since that would have made him look bad. As it stands, his plan was pretty solid although expecting Joe to just backout at the end wasn’t too realistic. He’s easily the most evil character in the series. I think if Nanbu and Joe had talked to Yuri then maybe they could have avoided some of this, but it was a complicated situation. Through his journey to the end Joe did manage to fight some other notable characters as well. There were two in particular. The first is Aragaki who was Nanbu’s first pupil. He has good reason to be upset since everyone basically ditched him. He’s still not all that reasonable though with how he’s targeting Joe though since he’s not just using him as a scapegoat. His fight is definitely an intense one though and one of the more memorable bouts in the series. Then there is Mikio who is actually a pretty great antagonist. He’d be second only to Yuri from the villain side. What really works for his plot is the fact that Mikio is a wild card. He wants to take down both Joe and Yuri while foiling Yukiko’s ambitions at the same time. This would also destroy all of Fujimaki’s plans. Basically if he wins then everyone else loses. I always love it when a third party steps in. There’s just so many ways they can wreck everyone’s gameplan. Still, you’ll know right away whether he has any chance of succeeding just because there’s only so many wrinkles that a show can have before getting back on track. This isn’t the kind of show that’s going to subvert the ending to such a degree. From episode 3 or even earlier you know how the final fight is going to go down. There’s no room for someone like Mikio there. I did like his armor though and overall he is a charismatic fighter. This isn’t the kind of show that will likely get a season 2, but if it ever did I could see him getting a role. As far as the ending goes, it’s pretty lackluster. Fortunately the rest of the show is solid enough where it doesn’t really matter but I feel like it did everything wrong. I don’t really like Joe’s intentions at the end. It’s not that they’re bad, but it seems really out of character. Was his final fight that intense/satisfactory? Then Yuri’s end is also really not satisfying at all. I felt it was pretty excessive. Nanbu’s life is also basically wrecked so that’s too bad for him. Then there’s the outcome of the final fight which I wasn’t a big fan of. The show goes out of its way to reassure you that the outcome would have been different if one of the fighters hadn’t done something drastic before it started, but I was still hoping it would go the other way. The conversation with the army that serves as a red herring also heavily hinted this was the case. It’s done intentionally to keep you guessing, but once you know the outcome then the conversation makes absolutely no sense. Ah well, the ending could have been a lot worse. I do have one other complaint, but this one’s more about power levels. At the start of the show the gear is hyped up quite a bit. It’s considered madness to get into the ring without gear and expect to walk away with your life/the win. Well, when Joe does this for almost the whole series it doesn’t seem to be much of an issue. Sure, the punches hurt a little bit more, but that’s about it. I don’t know, I was expecting much more of a difference. It feels like everyone could just fight without gear without many side effects. Sure, as a competitor you take whatever edge you can in order to secure the win so it makes sense from a narrative perspective why they would use it, but the gear should offer more of an advantage. Joe could have still won by dodging hits. The irony is that he always takes a lot of hits in every match so if the gear was even remotely stronger than a normal punch Joe definitely should have been dead in several of those fights. So I think the gear mechanic wasn’t really handled as well as it should have been. After all, the show was epic even without it. All of my favorite hype scenes didn’t even involve gear. One if the first confrontation with Joe and Yuri where they nearly spar. It’s an intense moment and while Yuri actually did have the gear on under his jacket, it’s just about Joe defying authority. I also liked the stinger with Mikio showing up to blackmail Joe and then the sucker punch. It’s too bad Joe couldn’t have fought him right there though. That would have been fun. Then we also have Joe crashing the announcement party to try and throw himself back in the tournament. Again, Joe’s just a great character who is always trying to get in on the action. It’s impressive how much he does in only a few episodes. 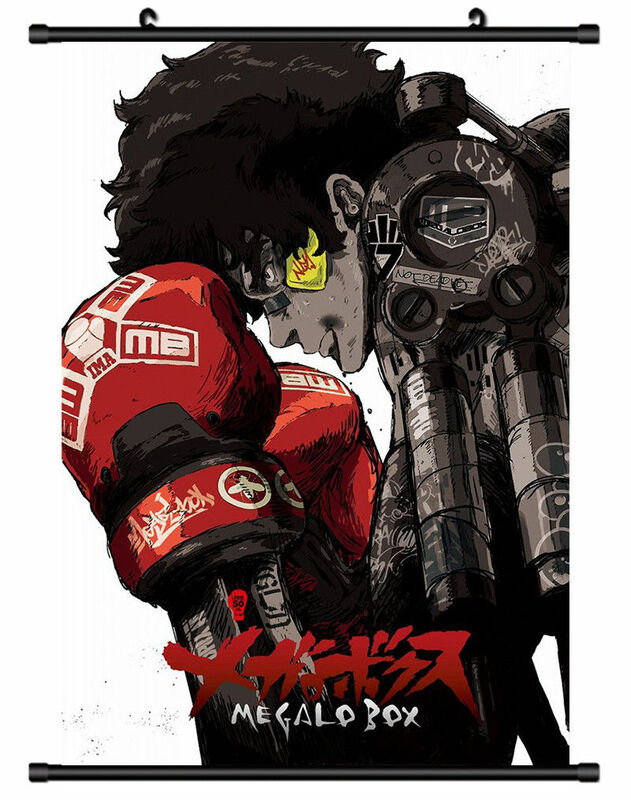 Overall, I would definitely recommend Megalo Box very highly. It’s a very complete anime title and one that has no real weaknesses. The character cast is strong and the anime looks/sounds very good. The plot is pretty memorable and the episodes offer great cliffhangers so you’re always ready for the next installment. 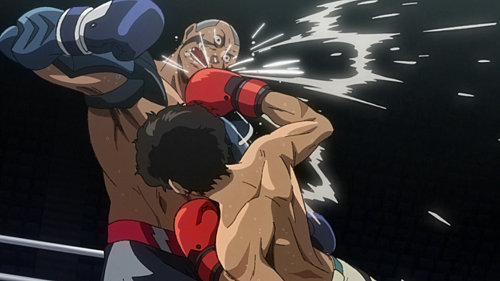 Megalo Box does more to keep its events memorable in 12 episodes than some do in 26. 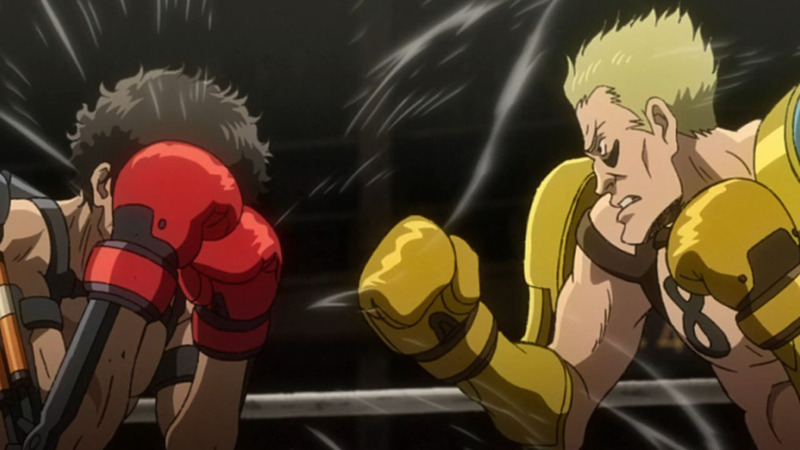 It’s going to be very hard for another boxing anime to top this one. Not saying it’s impossible of course, but this one really knew how to keep boxing exciting and fresh. This entry was posted in TV Shows, Reviews, TV Show Reviews and tagged Joe, Review, Action, Anime, Anime Review, TV Show, Sci-Fi, Boxing, Megalo Box, Megalonia by dreager1. Bookmark the permalink.